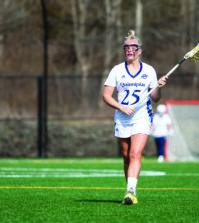 Although no one is graduating yet, many Quinnipiac class of 2018 athletes have celebrated the conclusion, or near-conclusion, of their collegiate careers. And while the fall athletes aren’t celebrated as much as the winter athletes on this campus, the fall athletes have a lot to be proud of. Men’s soccer captain James Doig, who is technically a graduate student, became the program’s winningest player in history this fall. The seniors on the women’s cross country team won the MAAC championship in 2015 and finished in the top three their other three years. The men’s soccer team seniors have made it to the MAAC championship twice and could get there for third time next week. The same goes for the women’s soccer team, who finished one game away from reaching another MAAC Championship game. But there are two big things that the fall athletes of the class of 2018 have done, one being on the field and the other being off the field. In 2015, the rugby team won the national championship over Army. Not only was it the first national championship in program history, it was also the first national championship in Quinnipiac history. Even though they were national champions, the controversy surrounding the program would only begin to arise after its accomplishment. In the same academic year, the men’s ice hockey team made it to the Frozen Four, and shortly after, the national championship game. But the men’s ice hockey team didn’t have the same fortune as the rugby team, losing to the University of North Dakota. 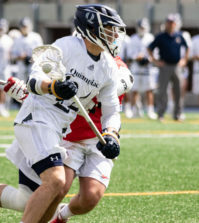 However, that didn’t stop Quinnipiac president John L. Lahey from sending a letter out to the school community congratulating the team on its season. There was a problem with that however; Lahey didn’t do the same thing after the rugby team won its title. The controversy spilled into the following season when the rugby team lost its field due to stadium construction. Unlike the other teams at the school that were temporarily displaced by the construction, the rugby team had to play all but one game on the road. The team’s one home game was held in Southington, CT at the Southington High School field. Nevertheless, the team persisted. Now-senior Ilona Maher led the team to an 8-1 regular season record, including a 213-0 victory in one game, as she won the MA Sorensen Award as the women’s rugby national player of the year. In the tournament, the Bobcats won all three games by an average of nearly 53 points per game, securing their second-straight national championship. In 2017, the Bobcats returned to Hamden and went 7-2 in the regular season. As the NIRA tournament starts next week, the Bobcats will enter the field as the No. 1 team in the nation and look to three-peat. The other accomplishment made by the fall athletes of the class of 2018 was the transition to the Big East made by the field hockey team. In their first two years at Quinnipiac, the field hockey seniors played in the MAAC just like most teams at the school. 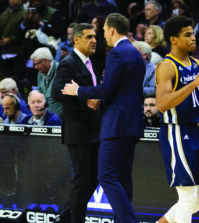 In those two years, the Bobcats made it to the MAAC Tournament, losing in the semifinals the first time and then in the championship game the second time. Even though they didn’t win a championship, Quinnipiac’s field hockey team joined the Big East the following year. Quinnipiac’s first season in the conference wasn’t great, but it wasn’t bad for a new team, as the Bobcats went 3-4 in conference play in 2016. In 2017, the team finished with the same record in conference play as last year, but showed that it earned its place in the conference. On Sept. 22, the Bobcats upset No. 21 Liberty, 1-0 and the victory could be considered the biggest in program history. It also felt like a vindicating moment for the team, as they improved to 2-0 in conference play at the time. Although they did lose four out of their last five, three of those losses came by a one-goal defeat. 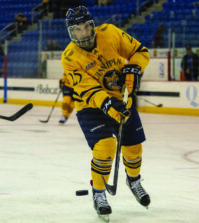 The one game the lost by multiple goals came on Friday when Quinnipiac lost to undefeated No. 1 UConn, 3-1. But in that game, they were the only team in the Big East this season to have been tied with UConn outside of a score of 1-1. Not bad for players that were recruited to play for the MAAC. 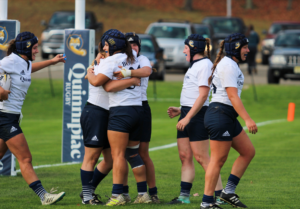 Behind the on-field successes of the rugby, men’s and women’s soccer, both cross country teams and the progression of the field hockey team, these fall sport seniors have a lot to be proud of as they’ve surely left their respective marks on Quinnipiac.